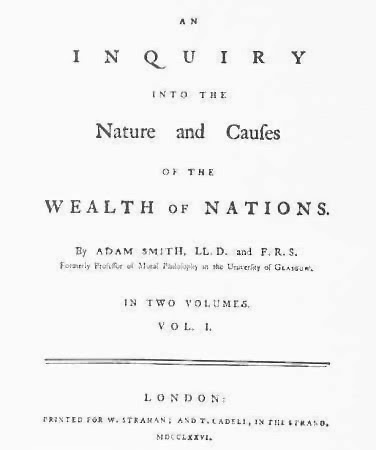 Adam Smith. (1723–1790). Wealth of Nations. But when the division of labour first began to take place, this power of exchanging must frequently have been very much clogged and embarrassed in its operations. One man, we shall suppose, has more of a certain commodity than he himself has occasion for, while another has less. The former consequently would be glad to dispose of, and the latter to purchase, a part of this superfluity. But if this latter should chance to have nothing that the former stands in need of, no exchange can be made between them. The butcher has more meat in his shop than he himself can consume, and the brewer and the baker would each of them be willing to purchase a part of it. But they have nothing to offer in exchange, except the different productions of their respective trades, and the butcher is already provided with all the bread and beer which he has immediate occasion for. No exchange can, in this case, be made between them. He cannot be their merchant, nor they his customers; and they are all of them thus mutually less serviceable to one another. 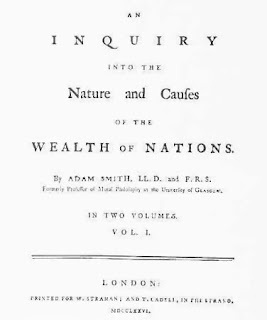 In order to avoid the inconveniency of such situations, every prudent man in every period of society, after the first establishment of the division of labour, must naturally have endeavoured to manage his affairs in such a manner, as to have at all times by him, besides the peculiar produce of his own industry, a certain quantity of some one commodity or other, such as he imagined few people would be likely to refuse in exchange for the produce of their industry. Many different commodities, it is probable, were successively both thought of and employed for this purpose. In the rude ages of society, cattle are said to have been the common instrument of commerce; and, though they must have been a most inconvenient one, yet in old times we find things were frequently valued according to the number of cattle which had been given in exchange for them. The armour of Diomede, says Homer, cost only nine oxen; but that of Glaucus cost an hundred oxen. Salt is said to be the common instrument of commerce and exchanges in Abyssinia; a species of shells in some parts of the coast of India; dried cod at Newfoundland; tobacco in Virginia; sugar in some of our West India colonies; hides or dressed leather in some other countries; and there is at this day a village in Scotland where it is not uncommon, I am told, for a workman to carry nails instead of money to the baker’s shop or the alehouse. In all countries, however, men seem at last to have been determined by irresistible reasons to give the preference, for this employment, to metals above every other commodity. Metals can not only be kept with as little loss as any other commodity, scarce any thing being less perishable than they are, but they can likewise, without any loss, be divided into any number of parts, as by fusion those parts can easily be reunited again; a quality which no other equally durable commodities possess, and which more than any other quality renders them fit to be the instruments of commerce and circulation. The man who wanted to buy salt, for example, and had nothing but cattle to give in exchange for it, must have been obliged to buy salt to the value of a whole ox, or a whole sheep, at a time. He could seldom buy less than this, because what he was to give for it could seldom be divided without loss; and if he had a mind to buy more, he must, for the same reasons, have been obliged to buy double or triple the quantity, the value, to wit, of two or three oxen, or of two or three sheep. If on the contrary, instead of sheep or oxen, he had metals to give in exchange for it, he could easily proportion the quantity of the metal to the precise quantity of the commodity which he had immediate occasion for. Different metals have been made use of by different nations for this purpose. Iron was the common instrument of commerce among the antient Spartans; copper among the antient Romans; and gold and silver among all rich commercial nations. Those metals seem originally to have been made use of for this purpose in rude bars, without any stamp or coinage. Thus we are told by Pliny, upon the authority of Timæus, an antient historian, that, till the time of Servius Tullius, the Romans had no coined money, but made use of unstamped bars of copper, to purchase whatever they had occasion for. These rude bars, therefore, performed at this time the function of money. The use of metals in this rude state was attended with two very considerable inconveniences; first with the trouble of weighing; and, secondly, with that of assaying them. In the precious metals, where a small difference in the quantity makes a great difference in the value, even the business of weighing, with proper exactness, requires at least very accurate weights and scales. The weighing of gold in particular is an operation of some nicety. In the coarser metals, indeed, where a small error would be of little consequence, less accuracy would, no doubt, be necessary. Yet we should find it excessively troublesome, if every time a poor man had occasion either to buy or sell a farthing’s worth of goods, he was obliged to weigh the farthing. The operation of assaying is still more difficult, still more tedious, and, unless a part of the metal is fairly melted in the crucible, with proper dissolvents, any conclusion that can be drawn from it, is extremely uncertain. Before the institution of coined money, however, unless they went through this tedious and difficult operation, people must always have been liable to the grossest frauds and impositions, and instead of a pound weight of pure silver, or pure copper, might receive in exchange for their goods, an adulterated composition of the coarsest and cheapest materials, which had, however, in their outward appearance, been made to resemble those metals. To prevent such abuses, to facilitate exchanges, and thereby to encourage all sorts of industry and commerce, it has been found necessary, in all countries that have made any considerable advances towards improvement, to affix a public stamp upon certain quantities of such particular metals, as were in those countries commonly made use of to purchase goods. Hence the origin of coined money, and of those public offices called mints; institutions exactly of the same nature with those of the aulnagers and stampmasters of woollen and linen cloth. All of them are equally meant to ascertain, by means of a public stamp, the quantity and uniform goodness of those different commodities when brought to market. The first public stamps of this kind that were affixed to the current metals, seem in many cases to have been intended to ascertain, what it was both most difficult and most important to ascertain, the goodness or fineness of the metal, and to have resembled the sterling mark which is at present affixed to plate and bars of silver, or the Spanish mark which is sometimes affixed to ingots of gold, and which being struck only upon one side of the piece, and not covering the whole surface, ascertains the fineness, but not the weight of the metal. Abraham weighs to Ephron the four hundred shekels of silver which he had agreed to pay for the field of Machpelah. They are said, however, to be the current money of the merchant, and yet are received by weight and not by tale, in the same manner as ingots of gold and bars of silver are at present. The revenues of the antient Saxon kings of England are said to have been paid, not in money but in kind, that is, in victuals and provisions of all sorts. William the Conqueror introduced the custom of paying them in money. This money, however, was, for a long time, received at the exchequer, by weight and not by tale. The denominations of those coins seem originally to have expressed the weight or quantity of metal contained in them. In the time of Servius Tullius, who first coined money at Rome, the Roman As or Pondo contained a Roman pound of good copper. It was divided in the same manner as our Troyes pound, into twelve ounces, each of which contained a real ounce of good copper. The English pound sterling in the time of Edward I., contained a pound, Tower weight, of silver of a known fineness. The Tower pound seems to have been something more than the Roman pound, and something less than the Troyes pound. This last was not introduced into the mint of England till the 18th of Henry VIII. The French livre contained in the time of Charlemagne a pound, Troyes weight, of silver of a known fineness. The fair of Troyes in Champaign was at that time frequented by all the nations of Europe, and the weights and measures of so famous a market were generally known and esteemed. The Scots money pound contained, from the time of Alexander the First to that of Robert Bruce, a pound of silver of the same weight and fineness with the English pound sterling. English, French, and Scots pennies too, contained all of them originally a real pennyweight of silver, the twentieth part of an ounce, and the two-hundred-and-fortieth part of a pound. The shilling, too, seems originally to have been the denomination of a weight. When wheat is at twelve shillings the quarter, says an antient statute of Henry III., then wastel bread of a farthing shall weigh eleven shillings and four pence. The proportion, however, between the shilling and either the penny on the one hand, or the pound on the other, seems not to have been so constant and uniform as that between the penny and the pound. During the first race of the kings of France, the French sou or shilling appears upon different occasions to have contained five, twelve, twenty, and forty pennies. Among the antient Saxons a shilling appears at one time to have contained only five pennies, and it is not improbable that it may have been as variable among them as among their neighbours, the antient Franks. From the time of Charlemagne among the French, and from that of William the Conqueror among the English, the proportion between the pound, the shilling, and the penny, seems to have been uniformly the same as at present, though the value of each has been very different. For in every country of the world, I believe, the avarice and injustice of princes and sovereign states, abusing the confidence of their subjects, have by degrees diminished the real quantity of metal, which had been originally contained in their coins. The Roman As, in the latter ages of the Republic, was reduced to the twenty-fourth part of its original value, and, instead of weighing a pound, came to weigh only half an ounce. The English pound and penny contain at present about a third only; the Scots pound and penny about a thirty-sixth; and the French pound and penny about a sixty-sixth part of their original value. By means of those operations the princes and sovereign states which performed them were enabled, in appearance, to pay their debts and to fulfil their engagements with a smaller quantity of silver than would otherwise have been requisite. It was indeed in appearance only; for their creditors were really defrauded of a part of what was due to them. All other debtors in the state were allowed the same privilege, and might pay with the same nominal sum of the new and debased coin whatever they had borrowed in the old. Such operations, therefore, have always proved favourable to the debtor, and ruinous to the creditor, and have sometimes produced a greater and more universal revolution in the fortunes of private persons, than could have been occasioned by a very great public calamity. It is in this manner that money has become in all civilized nations the universal instrument of commerce, by the intervention of which goods of all kinds are bought and sold, or exchanged for one another. What are the rules which men naturally observe in exchanging them either for money or for one another, I shall now proceed to examine. These rules determine what may be called the relative or exchangeable value of goods. The word VALUE, it is to be observed, has two different meanings, and sometimes expresses the utility of some particular object, and sometimes the power of purchasing other goods which the possession of that object conveys. The one may be called “value in use;” the other, “value in exchange.” The things which have the greatest value in use have frequently little or no value in exchange; and on the contrary, those which have the greatest value in exchange have frequently little or no value in use. Nothing is more useful than water: but it will purchase scarce any thing; scarce any thing can be had in exchange for it. A diamond, on the contrary, has scarce any value in use; but a very great quantity of other goods may frequently be had in exchange for it. First, what is the real measure of this exchangeable value; or, wherein consists the real price of all commodities. And, lastly, what are the different circumstances which sometimes raise some or all of these different parts of price above, and sometimes sink them below their natural or ordinary rate; or, what are the causes which sometimes hinder the market price, that is, the actual price of commodities, from coinciding exactly with what may be called their natural price. I shall endeavour to explain, as fully and distinctly as I can, those three subjects in the three following chapters, for which I must very earnestly entreat both the patience and attention of the reader: his patience in order to examine a detail which may perhaps in some places appear unnecessarily tedious; and his attention in order to understand what may, perhaps, after the fullest explication which I am capable of giving of it, appear still in some degree obscure. I am always willing to run some hazard of being tedious in order to be sure that I am perspicuous; and after taking the utmost pains that I can to be perspicuous, some obscurity may still appear to remain upon a subject in its own nature extremely abstracted.